This past week the University of Washington School of Nursing kicked off it’s centennial. It is both humbling and inspiring to be an heir to a legacy of excellence that now extends across a full century. The UW School of Nursing was founded at a time when the profession of nursing was very different from what it is today. This school and its remarkable faculty, staff, and students have played a substantial role in leading the profession’s evolution. From the beginning, we have been dedicated to educating nurses who were dynamic, forceful leaders as well as capable, competent clinicians. And from the beginning, this school of nursing has seen itself as part of not only the local community, but also the global community. For those of you who weren’t there at the time, let’s take just a second to look back a hundred years. Diploma-granting schools of nursing were few and far between. The UW School of Nursing was a pioneer endeavor. We were one of the first degree-granting, university schools of nursing in the country. At the time, most nursing education utilized an apprenticeship model in which nursing students provided care and received on-the-job training, room-and-board, and an occasional educational lecture. What they did not receive was a university degree. Nurses were a source of inexpensive labor for hospitals. They were caretakers first, and students only incidentally. One of the benefits of looking back is that it lets us see how far we’ve really come. The UW School of Nursing has played a prominent and proud role in changing the concept of what nurses do, and how they are educated. When we became an independent school of nursing, we were only the second such university-affiliated school in the country. Today, we grant not only a bachelor’s degree, but also masters, PhD, and Doctor of Nursing Practice degrees. At the UW School of Nursing, while we honor yesterday, we are responsible for helping to make the profession what it will be tomorrow. 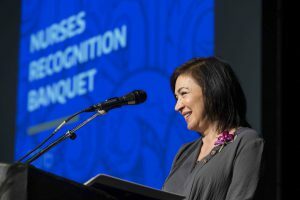 We are proud of our role, our faculty, and our graduates and we are equally proud to be part of a profession that includes distinguished nurse colleagues—nurses of influence—who are making an important difference in their organizations, their communities, and their profession.